Chipotle mayo is the cool kid on the block when it comes to sauces, and we think it’s totally deserved. Besides being the best partner-in-crime for crispy sweet potato fries, it also happens to make one of the best spreads/sauces in epic veggie burgers (like this one). Want to jazz up a boring sandwich? Want a homemade DIY dip for pizza crusts? Or how about something creamy to drizzle over tacos? Chipotle mayo is your answer. For our homemade version of chipotle mayo, we’ve found that you can make a pretty epic sauce with very minimal ingredients. Sure, you can get all fancy with your mayo add-ins, but let’s cut to the chase: whenever you’re craving a sauce like this, 90% of the time it’s when your minutes away from eating. As in: the sweet potato fries are golden brown and ready to come out of the oven. So that sauce better come together real quick, because we all know fries are best enjoyed hot. Which means we won’t be emptying the spice drawer for this one. And besides, why complicate things when you don’t need to? All you need for this recipe are two ingredients - but you probably already knew that, given the title and all. The first ingredient is your mayonnaise of choice. We typically use a store-bought vegan mayonnaise, but any plain old mayo works too. The second ingredient is a can of adobo peppers in chipotle sauce. If you’ve never bought a can of this before, now is the time. Canned adobo peppers in chipotle are actually one of our pantry staples, because they’re a great way to infuse smoky, spicy flavor into a variety of dishes - without needing a ton of additional spices. You can usually find these small cans in the Mexican/ethnic aisle of a standard grocery store. Aim for a brand without added preservatives, like San Marcos (our go-to). For this recipe, you just need the adobo sauce. You can save the peppers for another use, like this. To assemble the sauce, all you need is a bowl, a fork (or whisk) and your tastebuds. You can adjust the amount of adobo sauce used, to make it milder or spicier. Salt is listed as an optional (third) ingredient here. 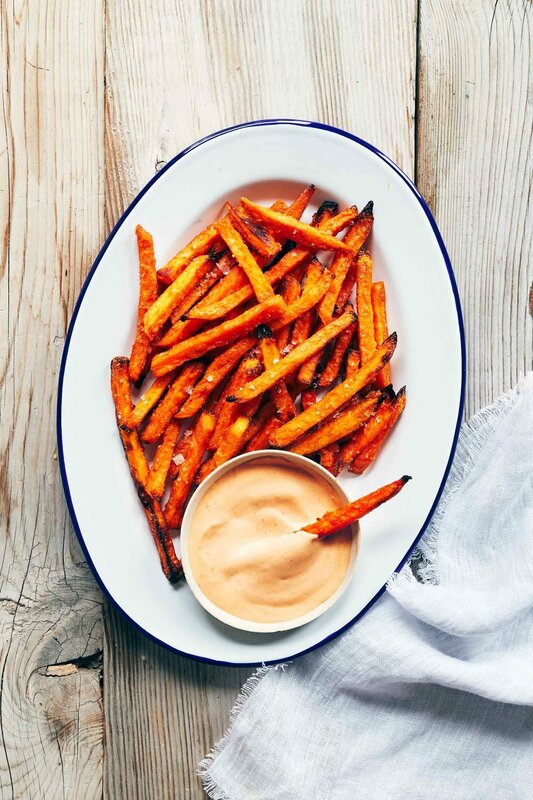 When we make this chipotle mayo as a dipping sauce for (already salty) sweet potato fries, we usually skip the added salt in the dip. But do salt to taste if you think it needs it. For spreading onto grilled veggie sandwiches or things less salty than fries, we often add a bit of salt before serving. Whisk together mayo and 1 tablespoon of adobo sauce. Taste, and if needed, continue adding additional 1-2 tablespoons adobo sauce until desired spiciness is reached. If using salt, add to taste. Store extras in fridge. -*For this recipe, you need the sauce that comes from a can of Chipotle Peppers in Adobo Sauce. You can reserve the chipotle peppers and extra adobo sauce for another use.